Samsung Electronics have been one of the most reputed manufacturers from several decades. The Samsung Galaxy J series is one of their flagship series of smartphones which is quite a hit amongst the public. The Samsung Galaxy J5 is a fantastic flagship smartphone in this series. It mostly targets the lower-middle class customers. It is reasonably in the budget and a good phone for college going students. This smartphone first announced in June 2015 and became available in the market on, June 2015. This smartphone was an upgrade from the previous version, Samsung Galaxy J series phones. The models related to this smartphone are Samsung Galaxy A5 and Samsung Galaxy E5. This smartphone is good for basic smartphone users. The USP of this smartphone is its innovative technology, high-quality device parts, and advanced processor. The best part about this smartphone is its good camera and display features. It comes with many rectifications from its previous models and hence is known to be a flagship model. Apart from these specifications, let us look at the other important ones too in this review. Eventually, we can figure out its various pros and cons. This smartphone comes with a curved metal frame. This metallic frame holds the hard plastic body which forms the core of this smartphone. It gives the smartphone a stylish and classy look. But it does not feel premium. It comes with a back cover which ensures that the smartphone is not slippery while holding it. The length of this smartphone is 142.1 mm. The breadth is around 71.8mm. The smartphone is quite thick with a thickness of 7.9 mm. It is pretty light weighing only 146g in total. The display used here is the Super AMOLED type display with capacitive touch. It also has 16 M colour vibrancy. The size of the screen is 5 inches with a resolution of 720 x 1280 pixels. It comes with good multi-touch feature and an amazing touch interface. It has an overall screen to body ratio of 67 % and a pixel density of 295 ppi. The overall look and feel of the phone is mediocre and because of its light weight, it is quite handy and easy to move around with. It comes in three different colour variations. The available colours are white, black, and gold. The OS used in this smartphone is Android v 5.1 ( Lollipop). The chipset used is Qualcomm MSM8916. The make of this chipset is Snapdragon 410.The central processing is taken care by a Quad – core Cortex – A53 processor. The clock speed of this processor is 1.2 GHz. The Adreno 306 GUIcontrol graphics interface. The storage capacity of this smart is pretty average. It comes with an internal memory capacity of a 8 or 16 GB. This for sure will not be enough even for the primary users. But, to compensate for this, this smartphone comes with the option of externally expanding the storage using a microSD card up to 128 GB. It has dedicated slot available for the microSD card. The RAM accessible in this smartphone is a mere 1.5 GB. This low RAM causes a considerable amount of lag if a lot of games are played or in case any heavy usage. This smartphone comes with dual camera features. The main camera is 13 MP and is decent for the low cost at which this smartphone is available. The aperture focal length of the lens is around f/1.9. It has a maximum wide angle of 28 mm. It comes with an LED Flash too. Additional enhancement features include auto-focus, geo-tagging, face detection and HDR among many more features. The secondary or front camera is only 5 MP and does not come with any Flash. It makes the capture pretty low-quality pictures. The aperture focal length of the lens is around f/2.2. It has a maximum wide angle of 23 mm. The audio in this smartphone is decent. It has average speakers and a 3.5 mm audio jack for headphones. It comes with a fully functioning FM Radio with RDS recording facility. The videos recorded using the primary camera in this smartphone have a resolution of 1080p. The frame capture rate is around 30. The battery capacity of this smartphone is around 2600 mAh. It comes with a user removable, Li – Ion battery. The average talk time of this smartphone is up to a max of 18h, and it has a music playback time of up to 40 h while on the 3G mode. This phone comes with dual sim facility. This feature is the most important in this phone. Both the sims have to be of the micro sim type. They work only with GSM network. They also have the basic wireless connectivity features like Wi-Fi and Bluetooth. They work on 2G and 3G modes. One of the sims does not have 4G compatibility. It only has 4G LTE functionality. The other sim has both 4G and 4G LTE compatibility. Samsung Galaxy J5 is known for its low cost and dual sim facility. Also, it has a good front camera and battery life. The disadvantages though are its low RAM and memory capacity along with the poor build. What are the dimensions of Samsung Galaxy J5? Samsung Galaxy J5 measures 142.1 x 71.8 x 7.9 mm (Height x Width x Thickness). What is the weight of Samsung Galaxy J5? Samsung Galaxy J5 weighs around 146 grams. Which Graphics Processing Unit (GPU) is used in the Samsung Galaxy J5? Samsung Galaxy J5 has Adreno 306. 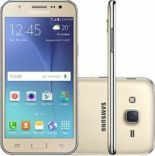 Is Samsung Galaxy J5 a dual SIM phone? Yes, Samsung Galaxy J5 is a dual SIM phone. Can we expand the storage of Samsung Galaxy J5 via micro SD card? Yes, the storage of Samsung Galaxy J5 can be expanded via Micro SD card upto 256GB (dedicated slot). What is the internal storage capacity of Samsung Galaxy J5? Samsung Galaxy J5 offers 8GB and 16GB internal storage. What colour options are available for Samsung Galaxy J5? Samsung Galaxy J5 is available in three colors viz, White, Black and Gold. Is there a 3.5 mm audio jack is available in Samsung Galaxy J5? Yes, 3.5 mm headphone jack is available in Samsung Galaxy J5. Which processor is used in Samsung Galaxy J5? Samsung Galaxy J5 is powered by Quad-core 1.2 GHz Cortex-A53 Processor. How much RAM does Samsung Galaxy J5? Samsung Galaxy J5 offers 1.5GB RAM. How is the display quality of Samsung Galaxy J5? Samsung Galaxy J5 features a 5.0 inches Super AMOLED capacitive touchscreen with 16M colors. Which operating system runs on the Samsung Galaxy J5? Samsung Galaxy J5 runs on Android 6.0 (Marshmallow) OS. What are the Connectivity options available in Samsung Galaxy J5? Samsung Galaxy J5 sports Wi-Fi 802.11, Dual-band, Wi-Fi Direct, Hotspot, Bluetooth v4.1, GPS, micro USB v2.0. How many Sensors are available in Samsung Galaxy J5? Samsung Galaxy J5 has Accelerometer, proximity sensors. What is the battery capacity of Samsung Galaxy J5? Samsung Galaxy J5 comes with a 2600 mAh battery. Is the Samsung Galaxy J5 battery removable? Yes, the battery of Samsung Galaxy J5 is removable. Does Samsung Galaxy J5 support Fast Charging of battery? No, Samsung Galaxy J5 does not support fast charging. Does Samsung Galaxy J5 have FM Radio? Yes, Samsung Galaxy J5 does have FM Radio. Is Samsung Galaxy J5 waterproof? No, Samsung Galaxy J5 is not waterproof. Does Samsung Galaxy J5 support NFC? Yes, Samsung Galaxy J5 does support NFC. What are the camera specifications of Samsung Galaxy J5? Samsung Galaxy J5 has a 13 MP rear camera with dual-LED flash and a 5MP front camera. Does Samsung Galaxy J5 has loudspeaker? Yes, Samsung Galaxy J5 has loudspeaker. Can we shoot videos from the phone camera of Samsung Galaxy J5? Yes, you can record videos from the primary camera of the Samsung Galaxy J5.